If you missed this must-attend live event, a copy of the high resolution, fully digital recording is now available for a limited time! Now, here is your chance to get into the head of a Forex trader who makes money from over 90% of her day trades...for over 5 years! By now, most of you are familiar with the consistent gains Shirley Hudson has generated in her personal Forex trading. Shirley's success has led me to use her as a role model to demonstrate how developing traders can achieve the goal of consistent success. It took monumental changes in her psychological mindset and technical approach, together with some personal mentoring to turn her trading around. Becoming consistently successful is a huge challenge. Most traders simply do not understand what it takes to get there. 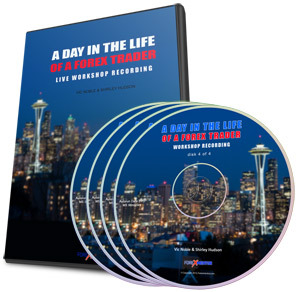 Since Shirley joined the team at Forexmentor.com two years ago, she and her mentor Vic Noble have co-authored 2 of our most popular training resources. They have also hosted regular webinars and interacted with many of our members, all for the sole purpose of helping traders to achieve consistency in their trading. After much discussion and months of planning, we were able to finally conduct a live training event in Seattle in January of 2013. Unfortunately, if you are reading this, you have missed the live event. But don't dispare, we have the entire event digitally recorded! Vic and Shirley want to offer those who want to completely immerse yourselves in learning all the aspects of what has made Shirley such a successful trader. We designed a setting that encouraged dynamic interaction and hands-on learning. Our goal was that you come away from the workshop with concrete strategies you can use right away. We will have an in-depth discussion of a day in the life of Shirley's trading which will show you: 1) Her favorite Recurring Patterns & 2) The London Close Trade. You'll learn, step by step, how to set up each day before it begins, and how to evaluate the day as it progresses. You'll learn how to properly evaluate technical price action and global fundamentals. We'll show you exactly how to lay out each trading day. You will get a chance to look over Shirley's shoulder and see what she does to be so well prepared to take advantage of trade setups. This workshop is recommended for those that have a good understanding of the basics of the Forex. It is very much intended for those who are familiar with their trading platform, have an understanding of basic chart reading, and are serious about taking their trading to the next level. Dave Deming - Author of "Driving Your Way to Success" joined us as a special guest speaker. Dave is a long time member who has become a master of trader psychology. He has completely transformed himself from a struggling trader to a trader who achieves consistent success. You will hear Dave share his valuable insights on every aspect of having the winning mindset. Are you ready for the day physically? ORDER THE FULL RECORDING IN HIGH RESOLUTION NOW! Just wanted to tell you how much I enjoyed the workshop and meeting everyone. I have been struggling with my trading for a while. I have been trying too many methods and getting nowhere. I actually stopped trading for the hundredth time about five months ago leading up to the workshop, just tired of losing money and sleep. I had no direction. The workshop was worth more than the price of admission to me. Really enjoyed Shirley and Dave's presentations too. Just a lot of great information; I learned something from all of you." - I.R.